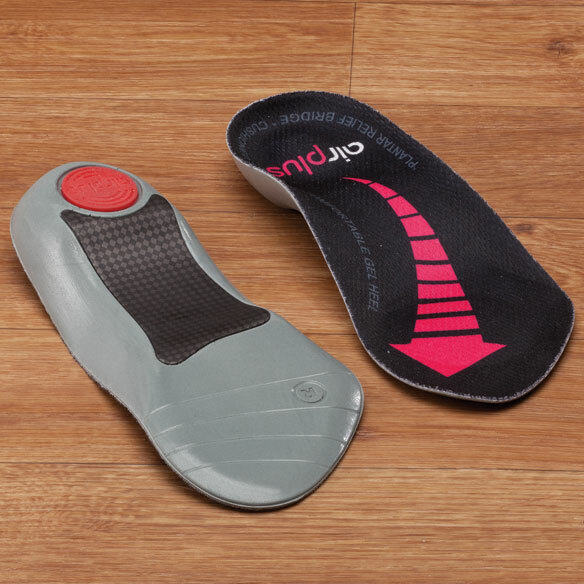 Treat feet to comfortable relief from plantar fasciitis, overpronation, supination and more with these Airplus® plantar fasciitis orthiotics. 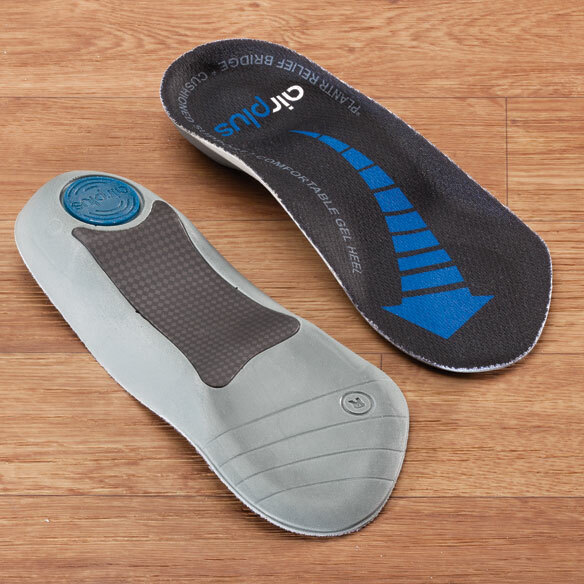 Simply slip these orthotics for plantar fasciitis into any shoes for instant arch and heel support. Arch plate supports and comforts the plantar fascia. Deep heel cup stabilizes and neutralizes. Gel insert cushions painful heel spurs. Slim, 3/4 length fits in any shoe without crowding toes. Inserts for plantar fasciitis are ideal for casual, athletic and dress shoes, even high heels. Choose from women’s 5 – 11 or men’s 7 – 12. I have very high arches and with these I no longer have pain when I walk. Finally I can walk without pain! I was diagnosed with plantar fasciitis two more nhs ago but my doctor wasn't helpful about what to do. I was at a loss, until I thought of Easy Comfort. These inserts really work. I can walk without pain. I have my mobility back! And they just fit inside my shoes. Very easy. The price is right too; better than th shoes I saw somewher online for over $120. I'm so glad I bought these. I could barely walk before. Helps to support my foot from pain! I put this in my shoe to help support my right foot when walking.Times like grocery shopping I am not hobbling to my car anymore, I can walk in comfort. I am happy with product provides comfort to my feet and helps with cushioning of foot. I have a high instep on my arch , and these have really helped me with more support and comfort in walking . Well made too . These are awesome. My feet don't hurt. Able to walk and stand without foot pain. I have bought these for my mom and she loved them so I ordered her another pair. I have a soldier in Afghanistan that I send care packages to. She has plantar fasciitis and heel spurs. I hope these make her feet more comfortable. I purchased inserts for plantar fascitis and they helped greatly. Bought another set so I can change shoes without having to remove the inserts. Great support in shoe's with lousey support. Would highly recommend them! I was diagnosed with plantar facilitis this summer so my podiatrist recommended I get inserts. Hope it will help relieve my husband's plantar fasciitis pain. My feet and legs hurt at night and I've tried several things to help. Thought these couldn't hurt to try. Have Plantars and need additional inserts. I chose this item for my mother to assist with arch support. Have been diagnosed with plantar faciitis. This looked like a reasonably priced option to try in my walking shoes. having a lot of foot pain and would like to see if this product helps. Have a pair. Really help my feet. Ordered before, they work! Needed for other pairs of shoes. I have heel pain and I'm on my feet all day. I have trouble walking a long distance. I hope this will help me walk better. Have trouble with my arches and hope this will help. May assist me with my planter facistitis. I have plantar fasciitis and bone spurs and desperate for relief of pain. Have never tried them before, so have high hopes and deep prayers that they will work!! Because I have overpronation and am hoping it will help. have leg aches so I can walk far and I know it comes from the bottom of my foot. Thinking this will help with my left and feet problems. They are great. Thank you for handling them. I'm having heel pain when walking. Will these shoe inserts help with that? BEST ANSWER: Thank you for your question. 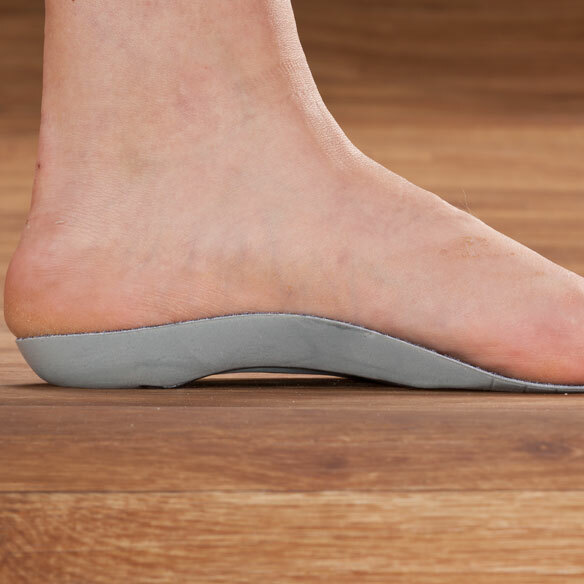 These inserts provide arch and heel support so they should help with heel pain. We hope this information will be of help to you. Would this work with a wider width foot? BEST ANSWER: Thank you for your question. Unfortunately these do not work for wider feet. We hope this information will be of help to you. I wear a women'wide width. Since men's shoes are wider , can I substitute a men's size to get a wider width? BEST ANSWER: Thank you for your question. You will want to select the men's size. The men's will fit shoe sizes 7-12. We hope this information will be of help to you. BEST ANSWER: Thank you for your question. The Women's fits sizes 5-11 and the Men's fit 7-12. We hope this information will be of help to you. Is there any latex in them? BEST ANSWER: Thank you for your question. It is latex free. We hope this information will be of help to you. According to Target, which sells this orthotic for 1/2 the price, the orthotic is latex-free. IS THERE ANY ELASTIC IN THIS PRODUCT? BEST ANSWER: Thank you for your question. No this does not have any elastic. We hope this information will be of help to you. HOW DO I ORDER THE SIZE WHERE DO I PUT MY SHOE SIZE IS IT ONE SIZE FITS ALL? BEST ANSWER: Thank you for your question. You will want to click the drop down and select men or women. Sizes are list and do not come in multiple different sizes for men or women. We hope this information will be of help to you.